Ricepaper magazine is celebrating 10 years of publishing, an evolution from a hand-stapled newsletter into a slick and authoritative magazine of Asian Canadian culture. 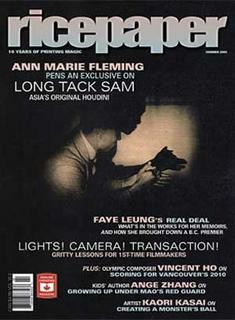 Many magazines with similar roots have flagged and failed over the past decade, but Ricepaper has grown to become one of the leading sources of information about established and emerging Asian Canadian artists, publishing such well-known names as Wayson Choy, Joy Kogawa, Kid Koala and Sook-Yin Lee. Plus it has ventured deeper year by year into non-fiction, covering issues of the Asian Canadian experience. The anniversary will be celebrated at Wild Ginger in Vancouver on Saturday, September 24 (the eve of Word on the Street). Sometimes we lose track of what's going right in the Canadian magazine industry. Ricepaper is one of those things. So we think we've got problems?